There are many reasons to Visit India at least once in your life. It is a country with a vast history with many historical monuments to visit, the traditional tour in the colorful Golden Triangle, the Ganga Aarti ceremony in Varanasi or the spectacular beaches of Goa. More than anything you have there to see, the most important thing is the experience of immersing yourself in Hindu culture, experiencing street food, smelling spices and incense and contacting the locals. This is what we are sharing with you in this India Travel Guide, full of informations and tips. It is certain that India will change you, even if you say no. You are going to see the world with different eyes, you will change your opinion on the most standard way of life and, above all, the experience of traveling in a country like India, will change the perspective on what you want to do with your life. On a trip to India you will meet new friends, locals and foreigners, you will have new experiences that will stay with you for the rest of your life. 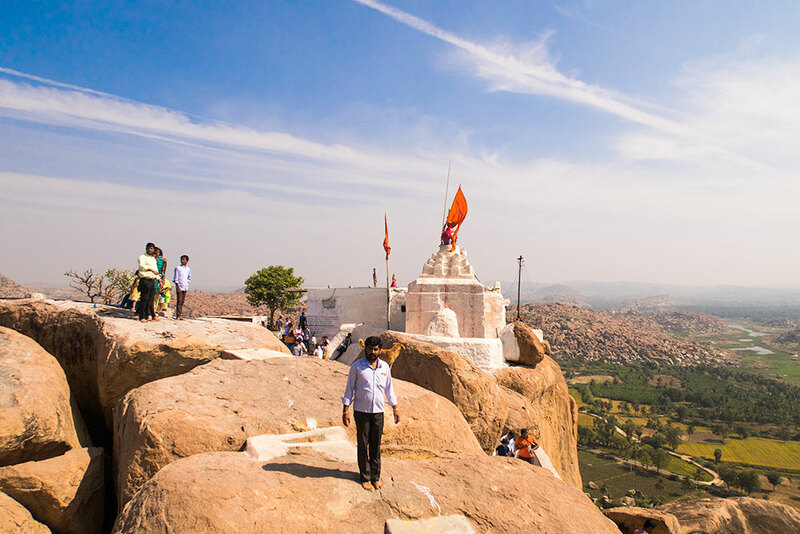 India is a country that can leave a strong mark on your life, for the intense experiences that you will live there, the whole history, the amazing temples, and the exciting and creative Hindu society. Discover all of this in this extensive India Travel Guide. India is located in the eastern part of the world, often confused by a continent, for its greatness. It’s the seventh-largest country by area, with 3.287 million km² and the second most populous country in the world, with over 1.2 billion people. India is bordered by countries like Pakistan in the West, China and Nepal to the north, Bhutan to the north-east, Bangladesh and Myanmar to the east, Sri Lanka and the Maldives to the south, surrounded by the Indian Ocean and not forgetting the paradisiacal islands of Andaman and Nicobar, with a maritime border with Thailand and Indonesia. It has 29 States, 4000 cities, of which 300 with a population over 1 million and seven cities with over 3 million people. India is a vast country with more than 20 languages, including Hindu and English, the two official languages throughout India. It will be perfectly normal to see many Indians speaking English among them, mainly because even for them it is difficult to understand the dialect of other regions. The local currency in India is the Rupee, also designated as Rs before the number (e.g., Rs. 100) or even INR (Indian Rupees). Some places in India also accept dollars and euros, so when traveling to India, it is advisable to take some money with you (dollars or euros), to buy anything you need as soon as you arrive, or for some emergency. However, you probably will not need it, as there are many ATM’s scattered in every city, including airports. When raising money, be sure to make as much money as possible (Rs.10,000), so that if you are in more remote areas without ATMs, always have cash with you. At the same time, try to always have coins or low notes with you, to be able to pay small amounts, like in the rickshaws or even in the street restaurants. Most Indian ATMs recognize Cirrus, Maestro and other well-known card systems around the world such as Visa. If you have any questions, your bank can confirm you better. For security reasons, please advise your bank about the dates you are traveling. It is a reasonable precaution, so that they know immediately if something happens, such as stealing your card. To enter in India you need to get a Tourist Vista. There is no Visa on Arrival. To get the tourist visa to visit India, you can do it online, on the India Visa Application Website. You fill out the online form and make the corresponding payment. The validation takes around 2-5 days tops. The best one of those three companies is Airtel. It has the best coverage all over the country and the best pricing. To buy a SIM Card in India, you need two photos, your passport and lots of bureaucracy. After you purchase the SIM Card, it takes around 24h to become active. The Airtel SIM Card costs Rs. 249 for 28 days, with the 2GB Internet for each day. It’s a fantastic option. But you must be careful with a large number of scams involving buying a SIM Card in India. When you decide to buy Airtel SIM Card in India make sure you stay in the same city until it becomes active. And don’t forget to demand the 2GB of Internet for each day. The culture of India is well demarcated across the country. From the most incredible and enormous Forts, symbolizing the great battles that have occurred in the past, the essential monuments of the Mughal Empire, the Portuguese dominion in Goa, Daman and Diu, and the secular British rule in the country. There are monuments in every city that visits, mainly Hindus, but also many Muslim mosques and Catholic churches. But the most exciting part of the culture in India is the street, still with old habits well present, to live with the modern world, such as bazaars, men cooking naan, tasty natural juices or even cross paths with elephants, monkeys and many cows down the street. It’s the most emblematic Hindy ceremony in India, and there is no better place to witness it than in Varanasi, the holiest city in all India. 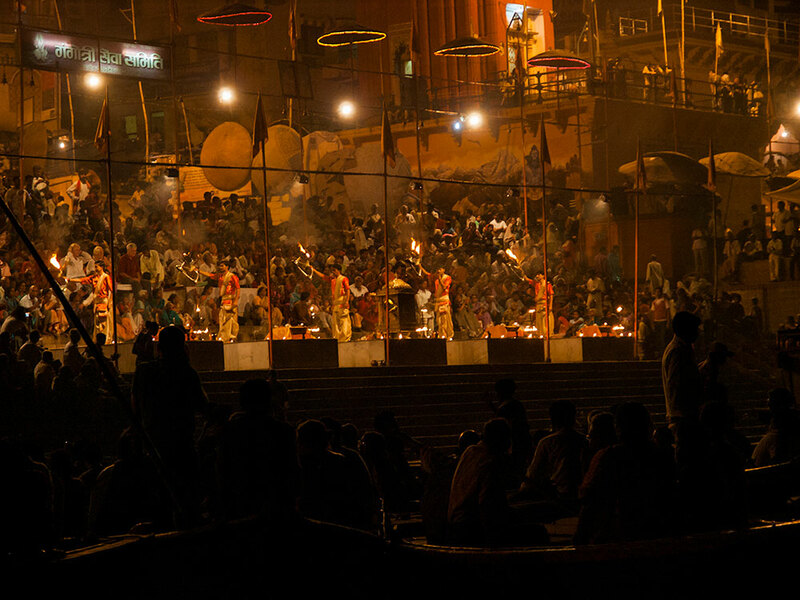 Ganga Aarti Ceremony in Varanasi takes place in the holy Dasaswamedh Ghat at sunset and lengths less than an hour. The best place to watch it is in the middle of the Ganges River. 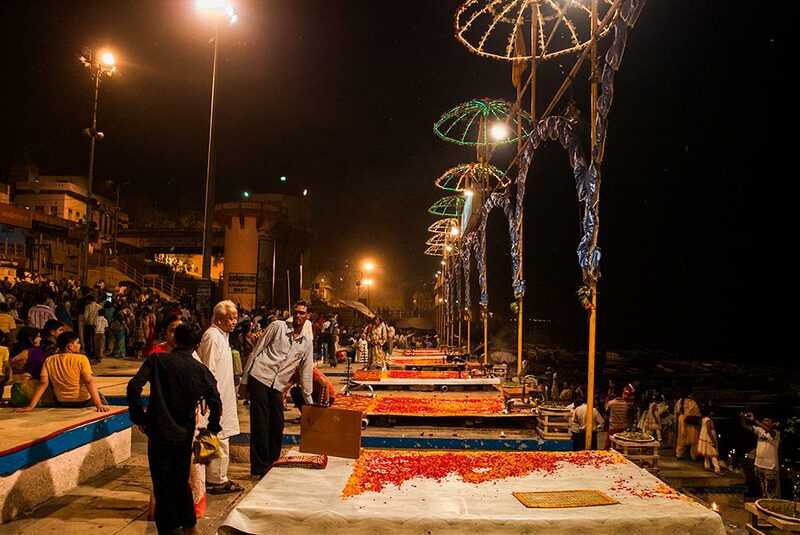 During the preparations for the Ganga Aarti ceremony, is normal to see people bathing in the River, the Sadhus performing rituals and many pilgrims from India. 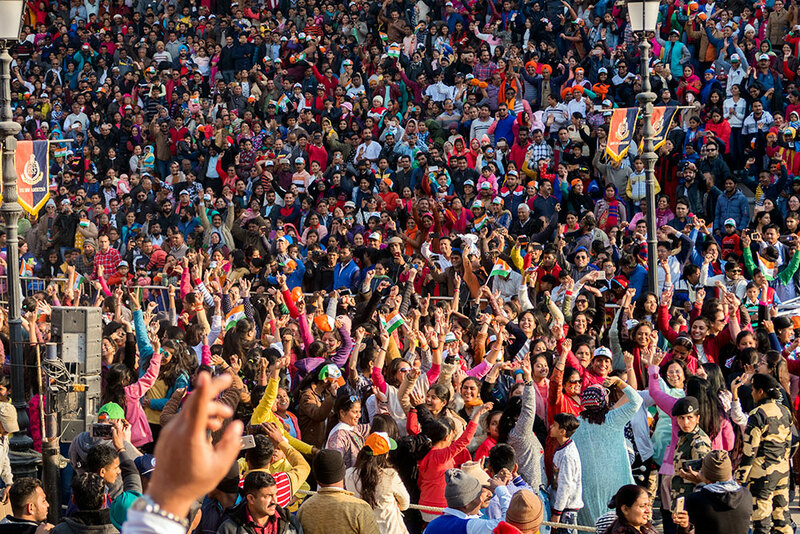 Perhaps one of the most wondrous events in all India, Wagah Border Ceremony takes place, every evening, near the Punjabi city of Amritsar, in the Indian and Pakistan border in Lahore and represents the closing of the frontier. As you may imagine, it Wagah Border Ceremony happens every single day, but it’s during the weekends when it gets the most frenetic environment, absolutely crowded on both sides (India and Pakistan). Soldiers performing in this ceremony are hand picked by their stature and gymnastic capabilities to perform this ceremony. They must march, lifting their feet up to their head, while maintaining a harsh expression, when facing their mirror in the other side of the border, doing the same thing at the same time. It’s an unforgettable ceremony that ends with the closing of Lahore border, for the day. 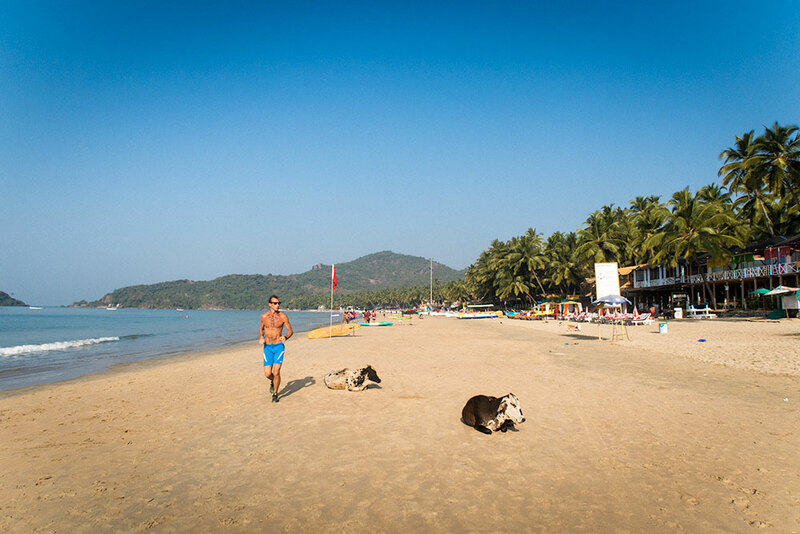 One of the most amazing beaches in Goa, Palolem locates in the south part, around 1h from Panaji, and it’s half moon form, surrounded by huts and palm trees, making it worthy of a real holiday dream. 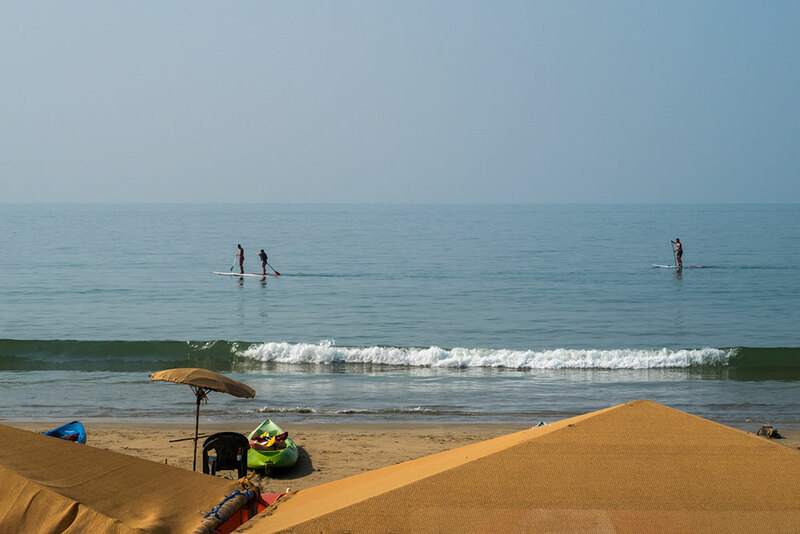 If during the day you can see and participate in many water activities like Sup, Kayaking, Boating or Swimming, in the evening, you can walk on the sand, with the cows calmly walking, posing for photos, or enjoying a beautiful sunset just after the Sundowner Bar. Unmistakably one of the deepest place in India, Golden Temple, also called as Sri Harmindar Sahib, is the holiest place for Sikhism all over the world. 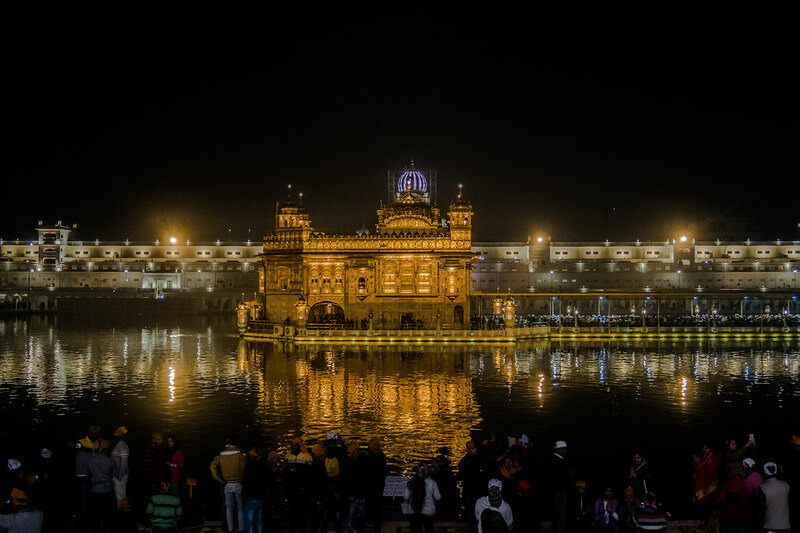 The Golden Temple is an impressive engineering structure, a dazzling place of worship, shimmering in the focal point of Amrit Sarovar, the pool in front of the temple which originates the city name – Amritsar. 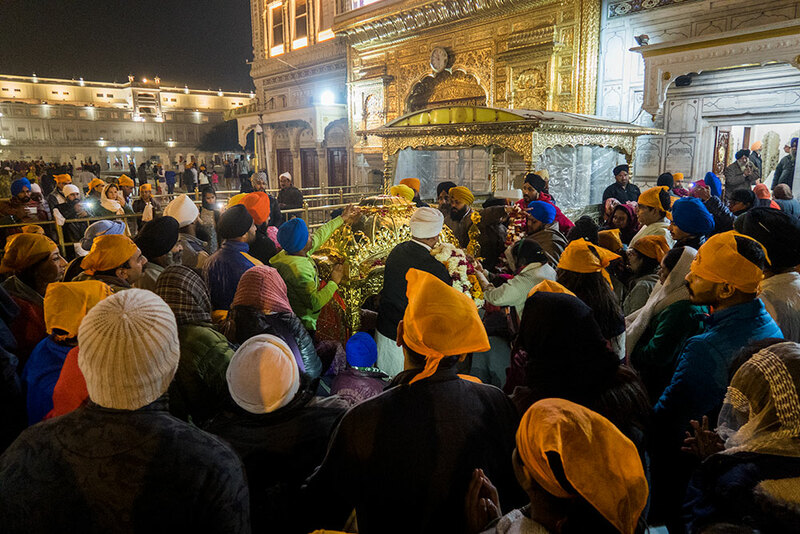 Pilgrims from all across the world come to this place of excellence and peacefulness to ear the chanting coming from inside the temple, and to pay respect to the Guru Granth Sahib (the sacred scripture). 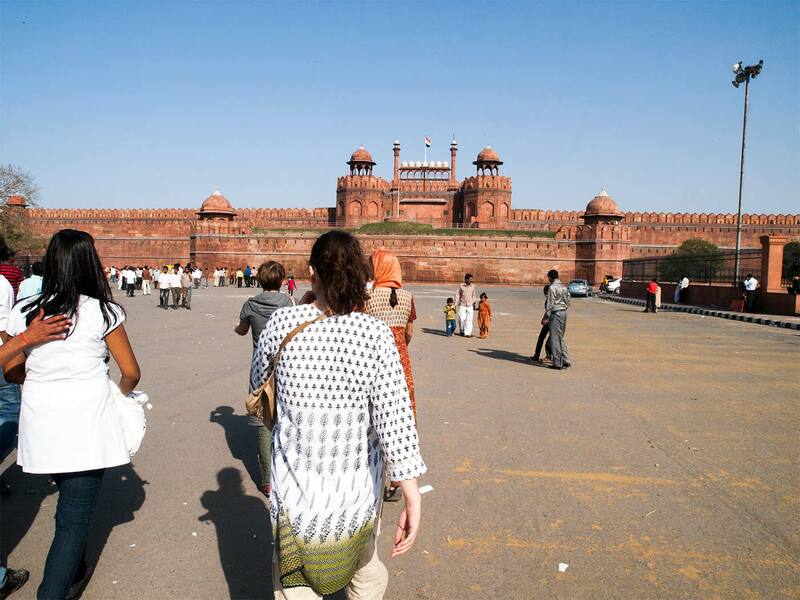 Many times offuscated from tourists in places like the Taj Mahal. However, the Golden Temple is equally beautiful and glamorous and doesn’t fall behind even a bit. Equally beautiful as the Golden Temple, the Taj Mahal, an artful culmination in the natural sense, has an atmosphere of sentiment, a nature of perfect symmetry, and is one of the best manifestations by the man on earth. An exemplification of adoration and excellence, a requiem in marble, mysterious, enthralling, enchanting―the rundown of appellations to depict the Taj Mahal is by all accounts endless. 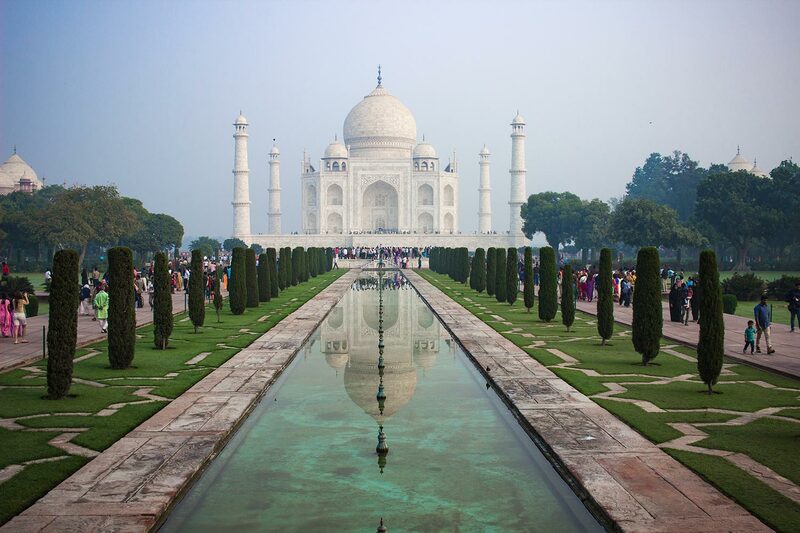 As you stroll through the beautiful garden that lies before the Taj, admiring the glorious bit of design, you are consequently taken to an alternate world. People who have seen this ‘enchantment in marble’ with their own eyes indeed will have that image and feeling in their mind and heart until the rest of their lives. Who hasn’t had an opportunity to see this remarkable building, ought to openly make time to visit the Taj sooner rather than later. One of the most prominent Forts of Rajasthan, Mehrangarh Fort is located 122 meters (400 feet) over the city, with an extraordinary view over the blue city of Jodhpur. 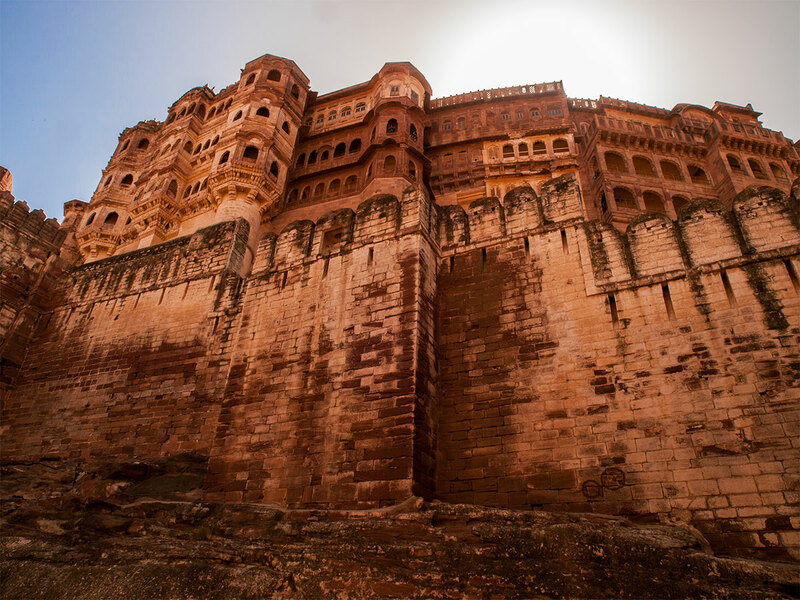 With sanctuaries and lots of Rajasthani cultures inside, the Mehrangarh Fort and its impressive structure give you all the reasons possible to pay a visit on your trip to India. Surrounded by the Thar Desert, Jaisalmer, also known as the Golden City in India, is one of the most amazing cities to visit in Rajhastan. And the most fantastic experience to have there is to spend a night in the Desert. 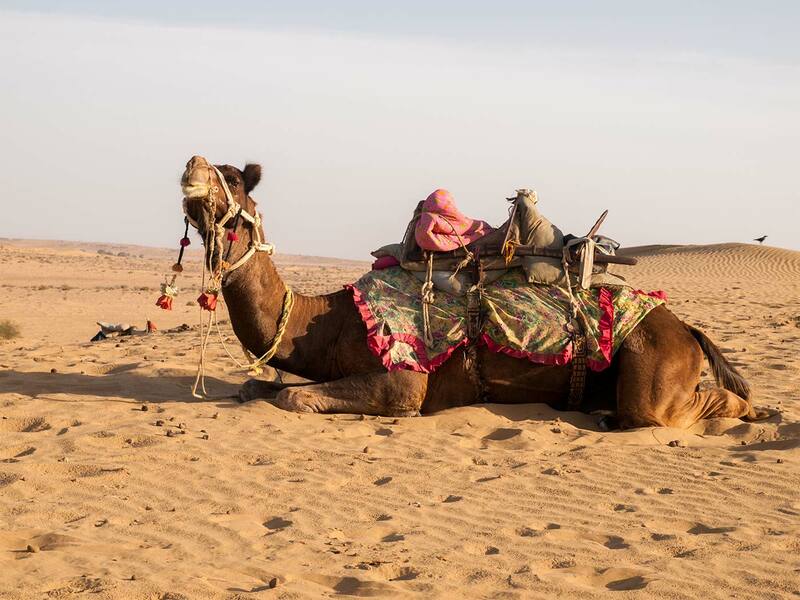 With a camel trip over the dunes until arriving at the campsite, where you will have dinner and sleep under the stars, with other fellow packers, the guides and, of course, the camels. Perhaps one of the most emblematic experiences to have in India and there is no other place better than Delhi and the Chandni Chowk Bazaar. Full of small shops, selling anything you can imagine, crowded, on the sidewalk and streets, with people, cars, rickshaws. 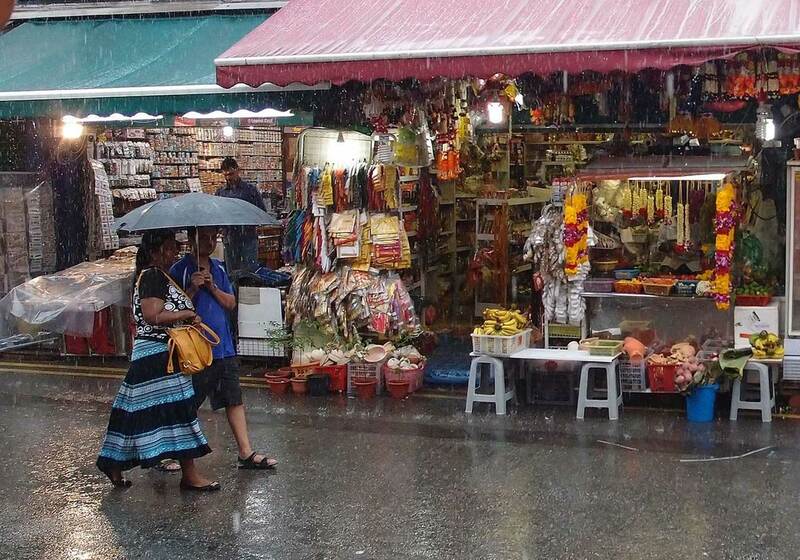 Nearby you have also the Spice Market, known as Khari Baoli. It’s here where you will find all kinds of spices from all over India and the nearby countries. 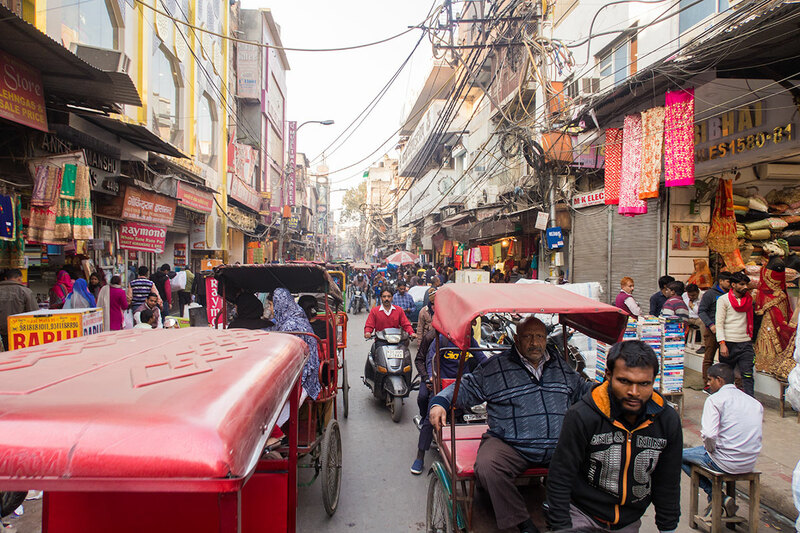 A few miles away, but still on a walking distance, visit the Main Bazaar in Paharganj District, where you can find all the hippie and refreshing clothing, to take with you on your travel through India. Rishikesh, the city of Beatles, or the capital of Yoga, it’s the perfect city to spend a few days, weeks or even months, depending on your time and purpose. Yoga courses to become a teacher is one the most important attractions in Rishikesh, however, having the experience of a boat ride on the Ganges, in that beautiful city is worth the experience. 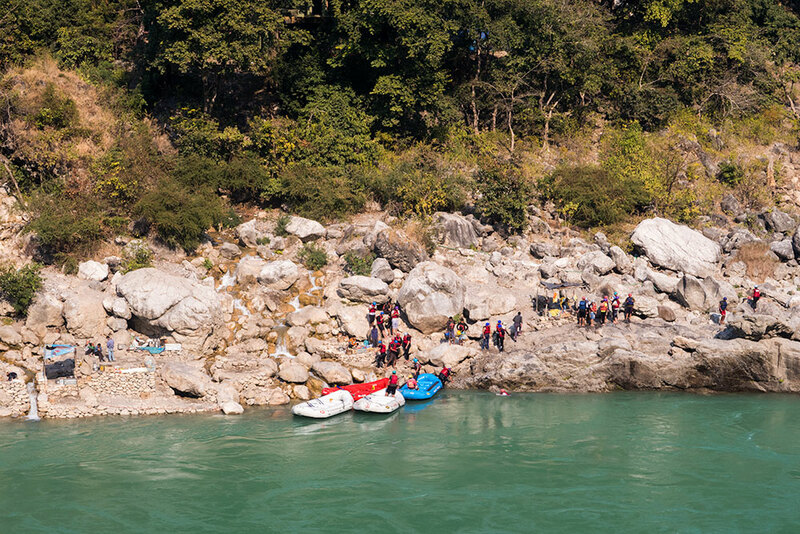 The rapids of the Ganges in Rishikesh attracts many people to try rafting while bathing themselves with the water and, perhaps, clean all their sins and, prepare them to make new ones. You can also try Bungee Jumping if you are crazy enough. After forts, beautiful buildings, temples, and bazaars, why not try the nightlife of the country’s capital. It can be an unexpected experience in India. Even though some of the fanciest bars are located in places like Connaught Place, if you are looking for a more local environment and an alternative one, the Hauz Khas Village is your place. 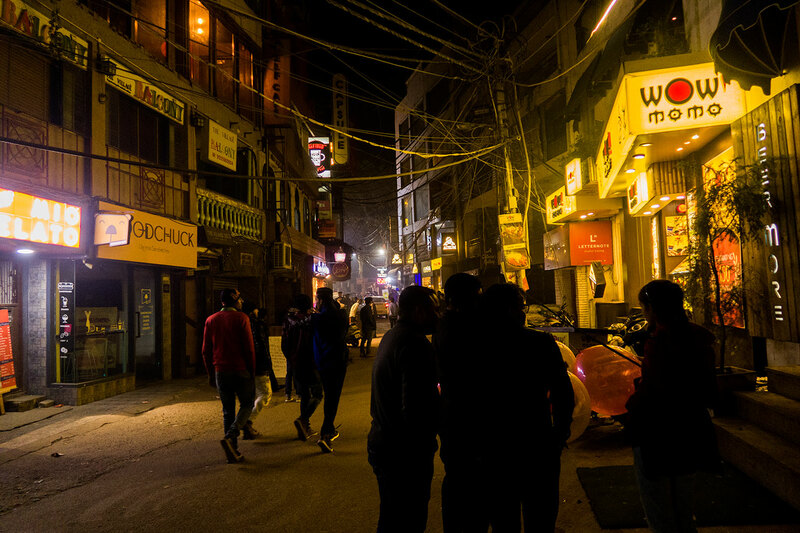 An enormous street full of bars, from one point to another, you can find all kinds of bars for many tastes, but it’s places like the Barsoom where you can find bars playing Hindi music, and local young people have a party inside. It’s worth a look and, don’t worry. It’s perfectly safe to go and be there. Delhi is a city of a shaking mixture: extraordinary richness and exceptional elegance alongside brutal poverty and trash. Today, a significant number of Delhi’s less-gleaming territories are witnessing a renewal, with sleek new shops and restaurants springing up in a portion of the least expected spots. The first impact for the first time visitors in Delhi is intense with a relatively overwhelming impression, which might be of absolute tumult. The movement shows up crazy. Bikes weave perilously among bigger vehicle, people on foot hazard life and appendage as they evade over the lanes. There is a consistent uproar of horns, and domesticated animals meander, apparently without any control. On the other hand, the dazzling engineering, lovely green spaces, the colorful bazaars, and a modern nightlife may surprise you positively. There are forts, mosques, and tombs in abundance, excellent pilgrim engineering, grand exhibition halls, incredible restaurants, cool greenhouses and large bazaars, markets, and shops (both top of the line and deal). Delhi is lovely for its all organization, even if sometimes it is hard to see it. You won’t see significant accidents despite the apparent chaos, and the way you can move around in the city is perfect. Besides it, it is unquestionable the magnificence and history you’ll find in Delhi. No other city can hold you more time than this calm and relaxing yoga town of Rishikesh, where people and animals live together in the same space, where the rhythm flows at a slow pace, where you feel welcomed by the clean nature and friendly people. Known as the yoga capital, Rishikesh is a small town in the foothills of the Himalayas, divided into two sides by the Ganga River. From that point forward, it has pulled in both recreation voyagers and soul searchers by the droves. While at the same time the previous will discover adrenalin support with wilderness rafting on the rapids, people who are looking for otherworldly comfort make a beeline for the ashrams covering the stream. Furthermore, devotees of The Beatles currently have an excellent motivation to follow in the strides of their symbols, with the ongoing reviving of the Beatles Ashram (Chaurasi Kutia). The throbbing heart of Rishikesh lies on and between the two suspensions bridges over the Ganges, known as Ram Jhula and Lakshman Jhula. Named after the two primary characters of Hindu epic Ramayana, these bridges create a perfect connection between the local people and the tourists. 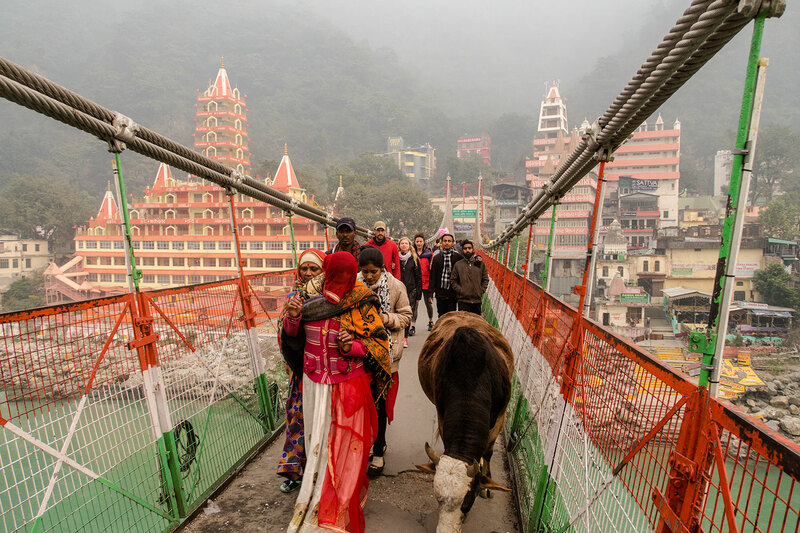 Begin your discovery of Rishikesh from the Lakshman Jhula, wriggling through the sacred animals and selfie sticks on the bridge, additionally skillfully dodging the motorbikes zooming from the two sides. Amritsar is a well-known city of the province of Punjab in India. It’s known as the blessed city generally went by the Sikhs from all around the world and known for the most beautiful ‘Golden Temple’. Amritsar City is the sacred and religious focal point of the Sikhs, yet people from all religions visit this place because of its divinity. 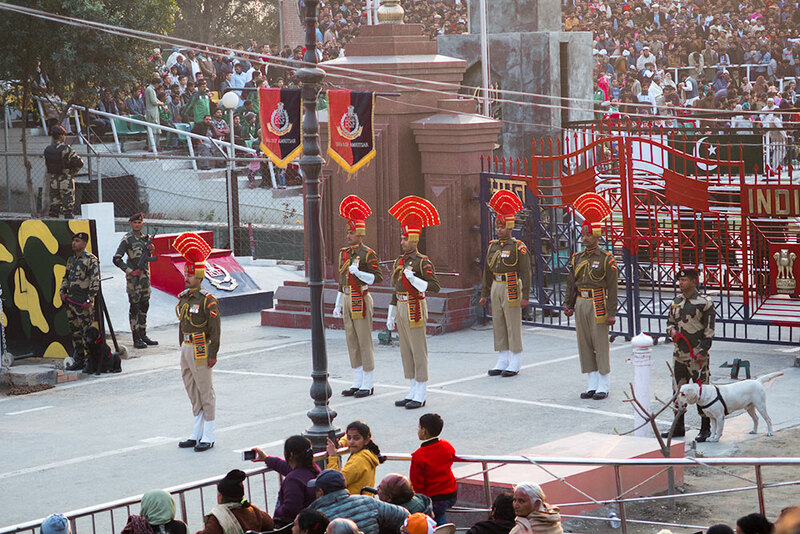 Besides the astonishing Golden Temple, a few miles from the city, on the border of India with Pakistan, you can witness one of the most incredible events in all India: The Wagah Border Ceremony. This ceremony happens every single day, starting during the evening time when the border is closing. Pakistan and Indian soldiers peculiarly march against each other, with a crowd from both sides applauding and laughing. You can see more information about this event here, with a video of the Wagah Border Ceremony included. Don’t miss it. Another fantastic thing in Amritsar is the streets itself, where you can enjoy walking on the streets, enjoying the street food, a crazy mix of vehicles, like multiple epochs were united in one single time. Sprawling along the banks of the blessed Ganges River, Varanasi, also known by the names of Benaras or Kashi, is often described as the capital of profound India. The city life is frantic and severe, vivid and disorganized. From early morning till long after dim, the riverbanks are mobbed by fans, homeless person sadhus (blessed men), seers, yoga specialists, bums, watercraft administrators, knickknack merchants, nibble dealers, silk-shop touts and going by explorers. However, regardless of the group, a demeanor of dedication still overruns. Numerous Hindu pioneers even make their last trip on the banks of the Ganges, going to the next life in the burial service fires that consume endlessly along Manikarnika Ghat. Varanasi’s old city extends over from the west bank of the Ganges in a labyrinth of walker rear ways, or galis. This tight tangle of paths can feel claustrophobic and swarmed, however, this is by a long shot the most barometrical piece of the city. Suitably nicknamed ‘The Golden City’, Jaisalmer is one of the real visitor goals in Rajasthan. Found near the Pakistan outskirt, Jaisalmer possesses the capacity to hold the great appeal as grand fortifications and castles that, after every one of these hundreds of years, still display polish and plushness. 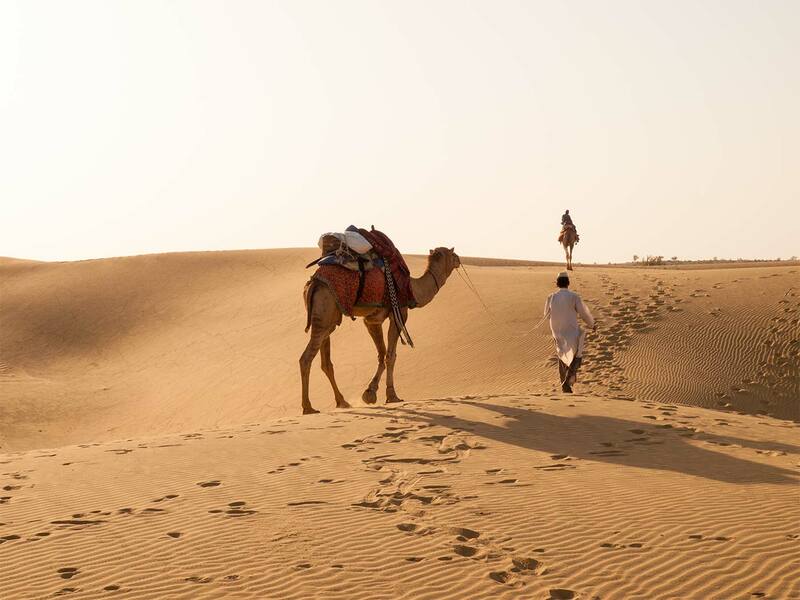 Lying near the vast Indian Thar desert, Jaisalmer Tourism is a blend of bunch encounters and undertakings. Gadisar Lake is a XIV century fake lake in Jaisalmer built to meet the water requirements for the bone-dry grounds. Today, the lake, with many half submerged lakes and places of worship, is a crown gem of Jaisalmer Tourism. 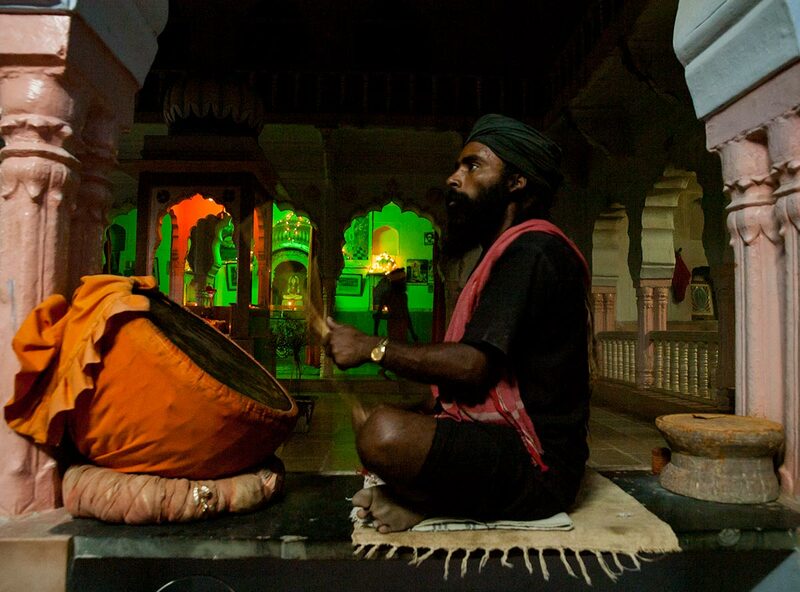 Pushkar is an unmistakable Hindu journey town that has an unmatched attraction. This hallowed town of Rajasthan is settled around a heavenly lake. With various washing ghats and sanctuaries, the heavenly Pushkar town witnesses a massive lump of visitor populace consistently. The voyage through Pushkar is honored with an exciting blend of dedication to God and cutting-edge tourism. While going to Pushkar, one should remember the endless sanctuary chain spread over the heavenly town. The voyage through Pushkar is inadequate without the experience of the great camel fair. This reasonable happens on the desert of Pushkar between the long stretch of October and November. Intended to be an exchange of camels and different domesticated animals, the Camel Fair ends up being a jubilee of the innate individuals of Rajasthan, pioneers, and vacationers from everywhere throughout the world. Panaji is the capital city of the territory of Goa in India. Is a delightful city secured with colorful shorelines and furthermore home to some exceptionally lovely Portuguese and old places of worship. Some old structures with displays and red rooftops which look beautiful, incredible terraced slopes, and a riverside walkway which makes it would seem that a hand painted the city. Among significant Portuguese developments, you can see The Rococo Lady of the Immaculate Conception Church which is an origination with standing Praça da Igreja next to it. Behind the church, you can visit the Fontainhas Quarter, a copy of a Lisbon neighborhood, with small colorful houses, with some coffee places and bakeries that exists since the Portuguese ruling, besides hostels and guesthouses where you can stay. 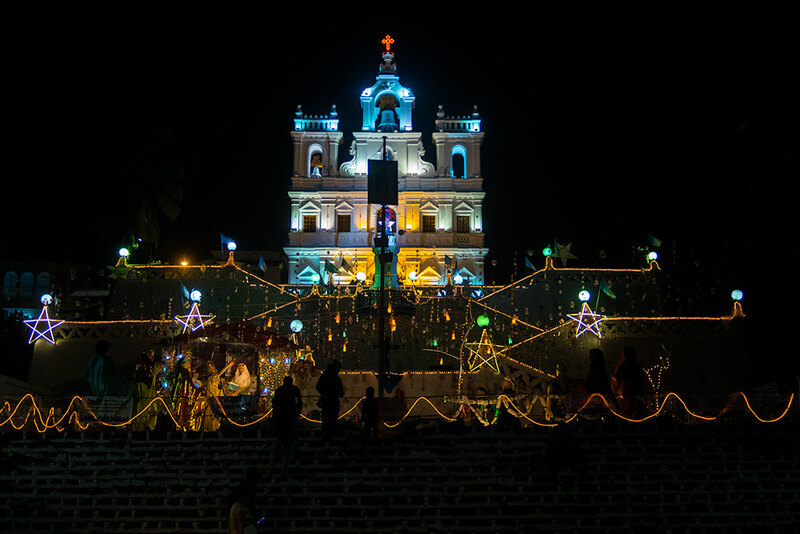 You should also visit the Old Goa city, the former capital, where the Portuguese left the most important Catholic symbols like the Basilica of Bom Jesus, Se Cathedral Church and Chapel St. Catherine. 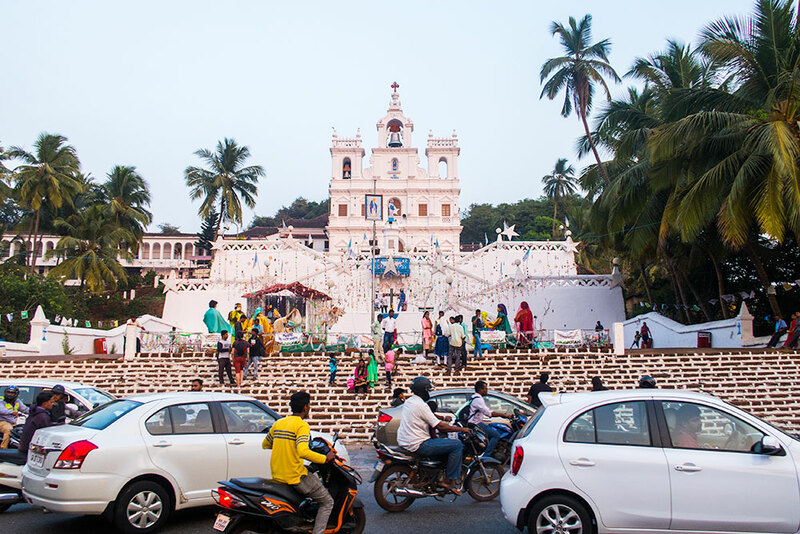 It’s an unmissable trip to the history of Goa. Palolem beach is located in Canacona in southern Goa, India, around 40m from Margao and it is the closest thing you will get closer to paradise. Palolem beach is to a great extent pristine and is possessed by both neighborhood anglers and by remote sightseers who live in shacks along the shore or in the first town itself. It is around one mile (roughly 1.61 km) long with a sickle form, limited by rocks on both sides. The profundity of the ocean increments step by step, being shallowest at the northern end of the shoreline, making it ok for regular swimmers, and calm streams. With boating trips, jet ski, a small cool bar and lots of sand and ocean to relax and catch some sun, Palolem Beach should be, with no doubt on your traveling plans in India. Jaipur, also known as the Pink City, is the biggest city of Rajasthan is an encapsulation of radiance and liveliness. 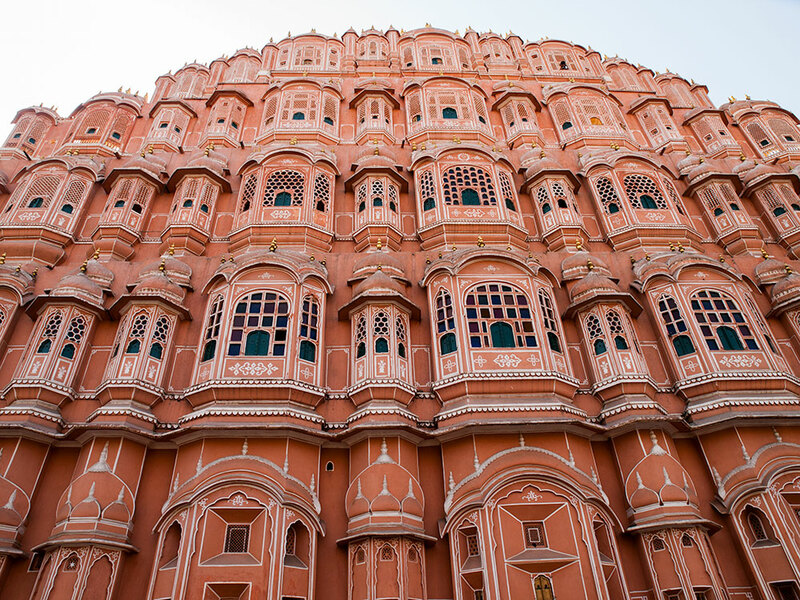 With unbelievable posts, lofty royal residences, quiet sanctuaries, and magnificent havelis, Jaipur is the perfect city to discover Rajasthan history. This city of Rajputs is notable for its fairs and fests that are hung on an exceptional level. The celebrations include the camel and elephants fair, to give some examples. 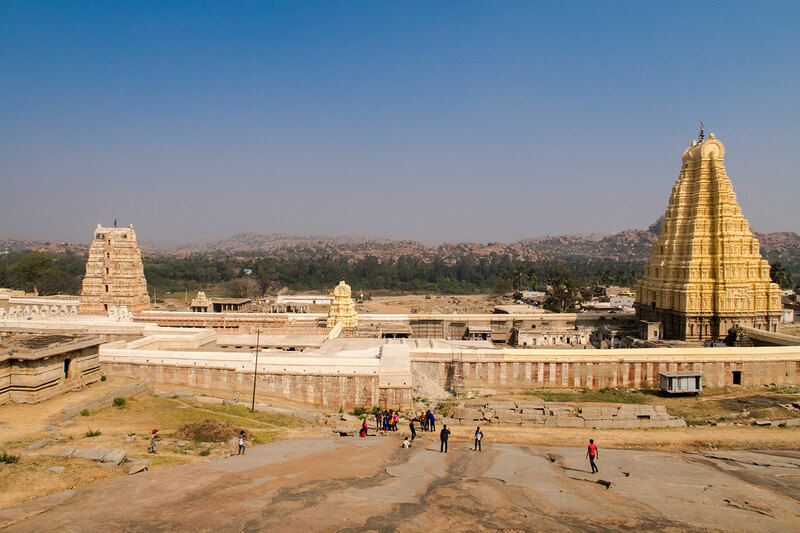 Hampi is a gem in India’s legacy magnificence. Located in Karnataka, this city tells the adventure of the glory of Vijayanagara realm for which it filled in as the capital city. Adding to its genuinely great status in the tourism business, Hami was also rewarded as a World Legacy Site by UNESCO. Hampi was an ideal case of a flourishing development before the Muslims captured it. With tons of sanctuaries which enlightens the praiseworthy aptitudes controlled by the skilled workers of that time. Most of the famous sanctuaries of all are the Virupaksha Sanctuary and Vittala Sanctuary. You will be awestruck to see a perfectly cut chariot before the principle complex of the Vittala sanctuary. On the other side of the river, locates the Hippie Island, or Hampi Island. A small and relaxing place, where all the guesthouses and coffee places are located, surrounded by boulders, rice fields, and palm trees. Hampi Island is the only place to stay in Hampi. Rickshaw drivers tend to scam people, saying there are no places to sleep in Hampi, so don’t trust them. Head to the river crossing and catch the boats. As soon as you arrive on the other side, you will feel such a calm mood installed in that part of the city. Indian cuisine is a general term for the wide variety of cooking styles in the country. In fact, India has a significant number of different regional cuisines than most of the continents. The preparation of Indian food involves fresh ingredients together with a mix of fresh, dried spices, which is the biggest foundation of the Indian Cuisine. Its main origins come from the two main religions in India: Muslims and Hindu, besides the Portuguese, Persians, and the English presence in India, influencing the Indian Cuisine. Portuguese merchants brought into the New World imports like tomatoes, potatoes, and chilies, which have turned out to be profoundly coordinated into Indian dishes. Middle Easterner dealers brought espresso and asafoetida powder. A little foundation on the shared traits and contrasts between India’s regional cooking styles can transform your next Indian supper into an invigorating, and profoundly satisfying, experience. Although Indian cooking is exceptionally locally particular, there are sure repeating flavors that join the diverse culinary practices. Every single provincial food is dependent on spices and vegetables. Indian food characterizes by four simple aspects: Hot, Spicy, sweet and sour. Maybe the most characterizing normal for Indian cooking is its differing usage of flavors, using more than 20 kinds of spices. Bean stew pepper, dark mustard seed, cumin, turmeric, fenugreek, ginger, garlic, cardamom, cloves, coriander, cinnamon, nutmeg, saffron, flower petal pith, and asafoetida powder are altogether used often in different mixes. The most strong flavor in the Indian Cuisine comes from the Meat or Vegetable Masala. A combination of spices, from which stand the cumin seeds, giving an intense flavor to all foods in India. A run of the mill North-Indian cuisine culture would include of chapatis or rotis or paranthas, rice and a grouping of accessories like dals, together with vegetables, curries, curd, chutney, and pickles. North Indian treats are fundamentally the same as in taste as they are gotten from a drain sauce or rice base and are typically absorbed syrup. South Indian food culture is to a great extent non-oily, cooked and steamed. Rice is the staple eating regimen and structures the premise of each feast. Cooking from northern India utilizes cream and oil. Southern Indian food is less oily, with most dishes being simmered or steamed, and coconut is a staple. Eastern India is known for its sweets, and western India has an assortment of cooking styles. Yogurt is regularly used to enhance dishes or as a sauce to cool hot plates all across the country. Cow hamburger and pork aren’t regularly seen as a part of Indian nourishment since dairy animals are holy in the Hindu religion and pork are illegal in the Muslim faith. Fish dishes are usual in beachfront districts like Bengal, Kerala or Goa. Poultry and sheep are regularly a typical dish in uneven zones and the fields. Half of India’s populace holds fast to a vegan abstain from food, from the perspective of Buddhism, Hindu or Jain religious qualities. Diverse products of the soil are delivered in various atmospheres, so a vast range of creativity is used as a part of Indian nourishment. Tomatoes, onions, cucumber, eggplant, and bananas are on the whole regularly devoured. Paneer Tikka Masala is a favorite North Indian dish, usually made with Chicken with a reddish sauce very spicy. Masoor Dal is a traditional North India food, made with thick lentil stew and the familiar Meat Masala. Butter chicken – Just like Chicken Tikka Masala, but instead of a spicy red sauce, it’s made with butter sauce. Tandoori Chicken – Made with basmati rice with turmeric and fresh onion. Samosas – Fired pastry with diverse kinds of filling, such as spicy potatoes, onion, lentils and sometimes chicken or lamb. They tend to be very spicy. Punjabi Chicken Curry – Another chicken dish, made with cloves, cinnamon, black cardamoms, tomatoes, and turmeric. Goan Seafood Chili – Spicy seafood together with vegetables and Masala. Thali – Combining the sweet, salt, bitter, sour, and spicy flavors in one dish, served on a platter, served together with basmati rice and chapati. Rogan Josh – Influenced by the Persians, typical in the Kashmir region, is made with lamb, cooked in pure ghee. The vast majority of India’s remarkable culture, behavior, and manners can be credited to India’s old customs and convictions. For instance, it’s polite to say “Namaste” to anybody, paying little respect to age, gender or status. This welcome can be used whenever in the day, dissimilar to Good Morning or Goodbye. “Namaste” means “I bow to the perfect in you”. The articulation follows its sources to Sanskrit and consequently comprehended the same way in all India. This specific type of gathering your hands in front of your forehead as a welcome is also a typical gesture in Yoga. Handshakes are turning up more regularly used, particularly in large urban areas however the namaste is dependably a protected decision if you are uncertain if physical contact is fitting. Try not to get shocked if they make inquiries and don’t hesitate to make similar questions. Subjects like films, cricket or political issues in India are good choices. Discussing family will likewise help assemble affinity. There are specific activities to maintain a strategic distance from in India. During the conversation don’t put your hands on your hips as this is viewed as forceful. Try not to shriek, wink, point, touch your ear or point your feet towards somebody. If you are invited to some party, remember that gifts are not expected in India. When you get there, before going inside the house, take off your shoes. As a guest, leaving a little some food on your plate demonstrates that you have enjoyed the food. India is a country full of scams, available on each corner you cross. There are many kinds of scams you will face and sometimes, you won’t be able to escape from it. Most of the times are all about pricing and bargaining, but other scams can involve losing a lot of money. There are scams like fake travel agents or false jewelry. You should be aware of this kind of scams and avoid them at all cost, or they can ruin your trip to India. Before traveling to India, you should take all the necessary vaccination, depending on the regions you are going. Hepatitis A is the most important, following the B. Most important is to get a travel consultant medic the to prescribe you all your medical needs for your trip. Read this article with a fully updated guide about all vaccinations you need to travel to India. The climate in India has many changes depending on the season you go and the part of India that you intend to visit. The northern part of India meets the coldest of winters, while in the south runs the most scorching summer. Except for the monsoon season (Jun-Sep), you can plan your trip at will, knowing that during February to May, the temperatures are quite hot in areas like Rajasthan and the whole south, while further north a more balanced climate. The area of the Himalayas is a little cooler, being the ideal time of year to visit places like Kashmir and Shimla, all covered with snow. Rainfall between July, August, and September is substantial across the country. To find more information about the weather in India, check this article with full details on the climate in India.